- R4iDSN (http://www.r4idsn.com/) support added. thanx to R4iDSN team for provided support. - 'tamagotchi no narikiri challenge (japan)' fixed. - 'cooking mama world - hobbies and fun (europe)' fixed. - 'mario vs. donkey kong - mini-land mayhem (usa)' fixed. - 'blue dragon - awakened shadow (france)' fixed. - 'call of duty - black ops (germany)' fixed. 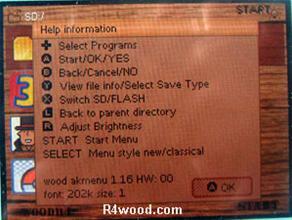 Wood R4 With Cheats Premium Pack 1.17 NEWEST!